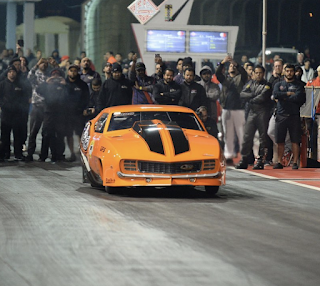 Kuwaiti, Duaij Al Sabah, Pro Mod Turbo Powered Car is probably the quickest 1/8th Mile Car on earth with a first 3.60s second ever after running a 3.62s and 3.61s at Bahrain International Circuit on a new car! In the past years, running a 3.64s was quick enough.But this now rearranges everything and raises the 1/8th mile stretch to a 3.60s. 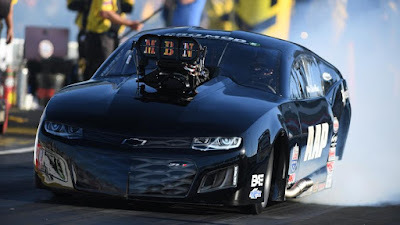 Would be glad to see them be the first 1/8th mile pro mod car to jump into the 3.5s! Over the next weekend Lizzy Musi will be at Orlando Speed World and we were quite lucky enough to run into his dad Pat Musi in Qatar where they been prepping a new set up for Richie Stevens Jr on the Speedtech Camaro Car. Orlando Speed World will be a nice spot to crash this 1/8th mile record and who knows? Getting ready to bring this beast back out again! Leaving to head south tonight before the snow comes. We will be at Orlando Speed World this weekend! If you are in the area come on out-Lizzy Musi!